Picture credit: Echelon Custom Homes. All in one basic kitchen lighting. Daylight pendant, recess lights. Jaw dropping design and perfect color selection by award winning custom home builder. How important is kitchen lighting? To answer this question, I am hoping I will figure out the right points. Please do not hesitate to make my article more shinier by leaving your comments. The functionality of the kitchen is being changed in these days from only cooking to gathering friends and having decorative part of the house. If you grown up in a “cooking” kitchen like me where one florescent lighting was used for lighting, you might be admired the novelty and the technology as well. 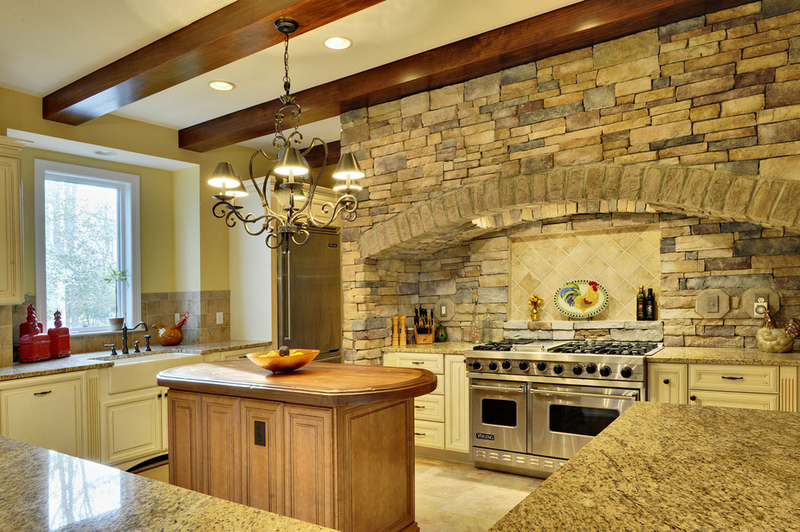 Kitchen lighting can change the scenic of your kitchen and gives a taste to your decoration. You might be lucky by having natural kitchen lighting to show the real beauty of your kitchen cabinets, backsplashes, countertops, floor, walls and appliances. Else, you will have a limited lighting in your kitchen to hide the beauty of your investment after kitchen remodeling. Picture Credit: Lapis Design Partners. Lucky homeowner has plenty natural lighting, Labrador Antique granite countertop in the island reflect all very well. In both cases, less and more, you need the right lighting in right way. Otherwise, you can flush the drain. How many lighting areas can be considered in the kitchen? Usually under cabinet kitchen cabinet fixtures can be used. These can be fluorescents, halogen lamps or stick on lights. Food preparation is such a detailed work and cannot complete with the right kitchen lighting. Picture Credit: The Lighting Division. I think this LED lights under the cabinet is a very attractive example. Opinion counts. Recess light is the most proper kitchen lighting. Sometimes, pendant can give good results. Picture Credit: Jason Synder. Over the sink or range lighting, I like the pendant. Upcycled and creative . The eclectic kitchen design is the best decision. Two thumbs up! They can illuminate your island. If pendant can be picked, at least three of them should be used as the fixture to show up the beauty of the countertop. As a novelty, led light under the island gives an ambiance to your kitchen. Picture Credit:Mal Carboy Design and Cabinets. Under the island led lighting and using clear chair to reflect this lighting is called the new era in kitchen design. Contemporary kitchen deserves the novelties. Especially the glass door cabinets have lighting inside. That will bring and exotic trend into your kitchen. Picture Credit: EAG Studio. Inside cabinet lighting. Contemporary and peaceful. How to bright your small kitchen by having right kitchen lighting? If you have a small kitchen without sunlight or limited light, you can have some mirror ball lighting that shines and reflects amazingly in your kitchen. Instead of one pendant on the ceiling, you can have several shades. If you have small kitchen do not go tall wall cabinets touching to the ceiling. Instead give a little gap between ceiling and molding and put Christmas light into the molding.